Lunatec Gear: Aquabot Sprayer & Bottle - 24 oz. Aquabot is like having portable running water in your pocket. It has shower, stream and mist spray patterns. 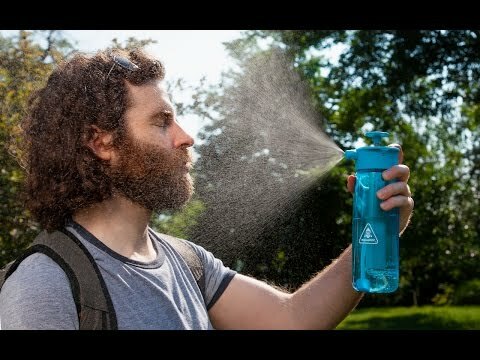 It sprays water up to 25-feet and is BPA-free. Aquabot is perfect for keeping cool and hydrated at sporting events, beach cleanup, tailgating, camping, hunting, water fights, gardening and so much more. Dimensions: 9.25" x 2.9" x 2.9"
This was a gift to my son-in-law,he is a daily, all kinds of weather bike rider and he really likes this water bottle. I live in Virginia where the summer HUMIDITY is horrible. I must ride early in the morning or later towards the evening. I fill the water bottle when I return from a ride and put it right into the refrigerator so it's cold and ready for the next ride. The spritzer spray has been a godsend. To those I pass it probably looks like I'm sweating up a storm but it has been a great purchase. Drinking from it....well, the spray stream is not a gusher so gulping water is not possible. For that, I carry another water bottle specifically for drinking. The best water bottle on the market! This is a great item for every athlete. The most setting is excellent for staying cool on a hot day. Will be getting more! gave to my grandson, who is a biker and runner. and he was very excited about it. 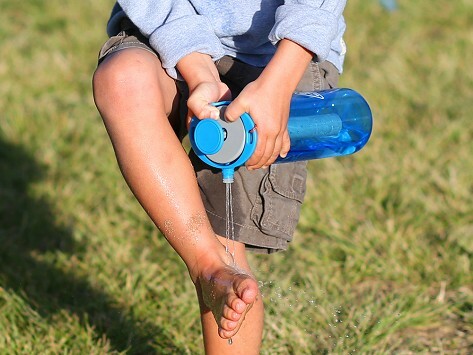 Aquabot turns an ordinary water bottle into a spray water bottle with a hose, mister, and shower all in one. It’s ideal for camping or hiking, and great to have around the house or just about anywhere else, too. Aquabot provides three types of spray—mist, jet, and shower. Each setting has a bunch of uses, both practical and fun. Use the mist to cool off at the beach or during a workout. The shower setting can be used for just about anything, like washing sticky hands (on grown-ups, kids, and pets) or drinking right from the nozzle. The powerful, 25-foot jet will crush the competition during a water fight, and get gunk off cars, boats, or whatever else could use a hosing off. Aquabot is BPA-free and even works upside-down. It comes with its own bottle but fits most wide-mouthed water bottles including Nalgene(R) and CamelBak(R) brands as well. Stay hydrated, cool, and clean (and secure your place as Water Fight Champion) with Aquabot.